If you need the best tool available for measuring physical and electrical phenomena under 10 million samples per second, look no further than the DL750 ScopeCorder. 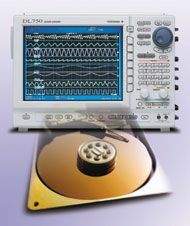 This unique and versatile instrument combines the benefits of a high speed oscilloscope and traditional data acquisition recorder. 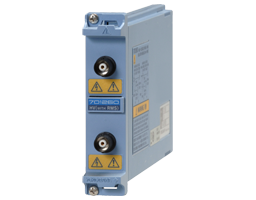 Designed for electro-mechanical systems, the ScopeCorder delivers higher vertical resolution, channel count, isolation, filtering, and abundant acquisition memory. 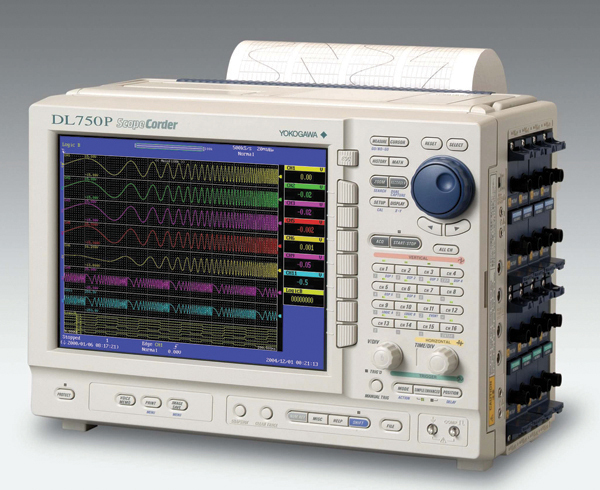 As a diagnostic tool, the ScopeCorder offers all the analysis tools of a modern digital oscilloscope, like cursors, waveform parameter calculations, math and DSP channels, FFT's, and more. In most cases, you can analyze your data and get results immediately, with no offline post-processing. As a recorder, the ScopeCorder can automatically send you an email, print your captured data, sound an alarm, and save your data when it detects a fault condition. Whether your observation times are microseconds or months, the ScopeCorder will stay on the job, and your data will be waiting for you when you are ready for it. 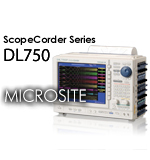 When you consider all that it can do, it’s no wonder the DL750 ScopeCorder is the Test of Time 2008 Award Winner. Amount of time data can be recorded with 1 GW memory. During durability testing, it is necessary to monitor the long-term trends of your data as well as capture the high speed transients that might occur. This presents a challenge as trend data is usually recorded at a slower sampling speed that might miss the transient phenomena. To meet this challenge, the DL750 offers the DualCapture function. Using DualCapture, you can now record your trend data with a slow sampling speed and still be able to capture the transient phenomena with a faster sampling speed. The waveform shown above was captured at a sampling rate of 50 kS/s. The occurrence of noise can be confirmed in the graph, but the time resolution is too low to capture the waveform accurately. With DualCapture, the user sets triggers for capturing sudden phenomena. Up to 100 phenomena can be collected in a memory length of 10 kW at a maximum sampling rate of 10 MS/s. Inputs for both acceleration and voltage, built-in AAF (anti-aliasing filter), supports built-in amp type acceleration sensors (4 mA/22 V), isolated input. The waveform numeric level (instantaneous value) updates approximately every second even when starting, stopping, or performing long-term observation of a waveform. Useful for confirming the waveform input condition, or temperature/DC waveform levels. Confirm the levels of up to 16 channels simply by pressing the ESC key. Supports history statistics. Increased number of cycle statistics items (from 24,000 to 48,000). Offers dedicated menus for extracting the knocking portion of the waveform from the rest of the engine cylinder pressure waveform. HPF, BPF, and differential filters available. Includes functions for eliminating noise when the bulb opens/closes and for triggering on filtered waveforms. Max 6 channels and OR trigger are available. 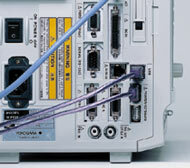 The DL750 can function as an independent Web server. Connect to your DL750 directly using Internet Explorer, and access a variety of services. Easily copy and paste files to and from a PC from the internal flash memory drive and other internal storage media. You don't have to use a separate program to transfer the data. Download screen images periodically or manually. Download waveform data, start or stop a measurement, or setup a split display by using this menu. This function downloads values of waveform parameters periodically, activates MS Excel automatically, and graphs the calculated values on the PC. This enables you to check the parameter trends at a glance. * AC and DC power supplies can be used together to ensure a highly reliable power source. An external DC source such as a car battery is used for the DC power supply. Adding this option enables the DL750 to be run under DC power (10-18 V) as well as AC power (100-120 V/200-240 V). This allows the instrument to be used not only for in-vehicle measurements, but also in a wide range of other testing locations. The power source is switched automatically (when AC and DC are used simultaneously, AC is given priority). The DC Power Box is only 20 millimeters wide1, and weighs 800 grams. The DL can still be placed on its back with the option installed. Simultaneous input of AC and DC power prevents loss of data when making observations over long periods of time (requires an external DC source such as a car battery). The DC input can be used as a backup power supply. If the AC power goes down, the DL instantly switches to DC input without interrupting the measurement. This option provides lower power consumption than when using an external DC/AC converter. This results in higher efficiency and significantly lower power consumption. Emission noise is greatly reduced compared with using an external DC/AC converter. High voltage switching noise is no longer a problem. The DL750's standard memory capacity is 50 MWord (2.5 MWord per channel). This can be expanded (optional) to as much as 1 GW (50 MW per channel). You can record data for 10 days (1 day/div) on the main screen, while displaying 1-second recordings (100 ms/div) in real time on the zoom screen. The large memory capacity lets you capture all of your data while still maintaining a sample rate fast enough to see any abnormal phenomena. Sufficient memory length is available even when 16 channels are used, so you can conduct extended observations on multiple channels (2.5 MW per channel with standard memory, 50 MW per channel with maximum memory). Having a wide range of triggers is of course very useful for obtaining stable observations of variety of different waveforms. In addition, the GUI menu makes setting trigger conditions easy and intuitive. 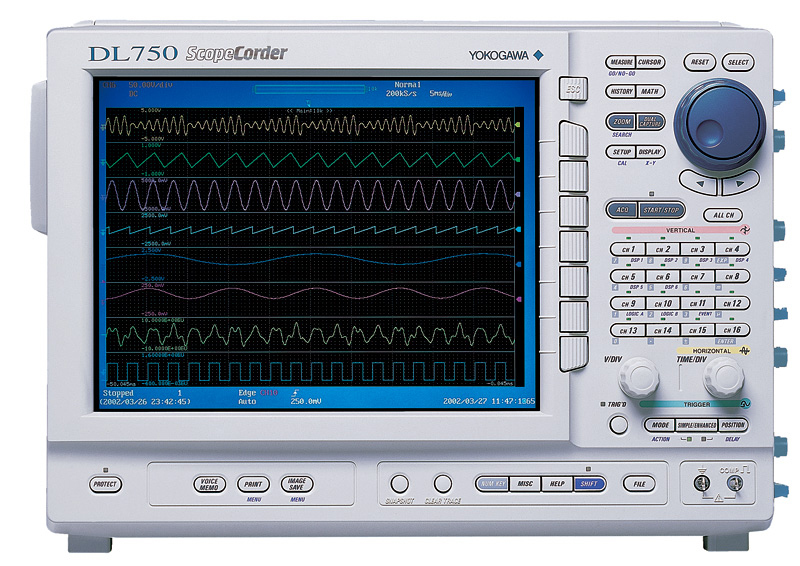 This function comes standard with the DL750 to allow observation power supply waveforms. In addition to traditional power supply troubles such as sudden outages, sags, and surges, you can make efficient real time observations of frequency fluctuations and voltage drops. The trigger activates when a signal exceeds the allowable values determined by comparing a defined waveform (wave window) with an actual waveform in real time. Comparative waveforms can be automatically produced in real time based on measured waveforms. 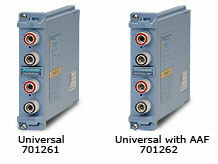 Detection on all 16 analog channels is available (with OR conditions). 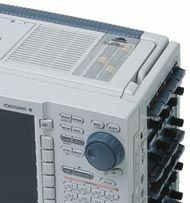 When this trigger is activated, the DL750 performs a specified action each time a waveform is captured and a screen is displayed. This feature is useful for automatically and reliably saving data (e.g., for data collection in automated, continuous tests). With this feature, a trigger can be executed whenever you like, separate from the preset trigger conditions. Occasionally, you may capture an abnormal waveform and then have it quickly disappear from the display as new data is acquired. It is not always possible to manually Start and Stop data acquisition to catch the abnormal waveform and have it displayed. The History Memory function was designed for such situations. It divides long memory into a number of blocks and automatically stores up to 2000 previously captured waveforms. This means you can reliably save displayed waveforms to memory even when there are events for which trigger conditions cannot be set. 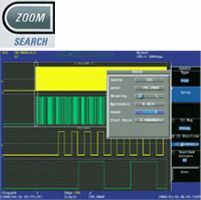 The Zone Search function lets you define zones on the screen and find all previously captured waveforms that either pass or don't pass through the user-defined zone. Up to four zones can be defined. Search (Edge Search) and Zoom The Edge Search counts rising and falling edges in the captured data. It automatically searches for the desired edges and displayed them on a zoom screen. New functions are now available with the DL750. 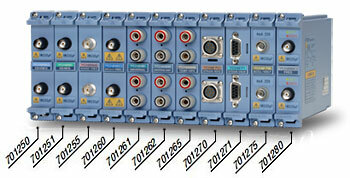 Six digital signal processing (DSP) channels have been added. The DSP channels enable you to perform math and digital filtering in real-time while acquiring waveforms. Each DSP channel can perform up to four arithmetic operations and filtering at high speed, without slowing down waveform acquisitions. Waveform parameterssuch as voltage, frequency, and RMS are measured automatically. In this mode, the DL750 determines a cycle, then calculates items pertaining to the voltage axis and surface area in that cycle. Range settings can be used to obtain accurate single-cycle RMS and average value measurements. This function automatically performs the following calculation based on a scaling coefficient A and offset B: Y = AX + B (X is a measured value and Y is the scale value). The results of this calculation are displayed in cursor measurement values and waveform parameter measurement values. In addition, a user-determined scale value can be defined for any two measurement points, P1 and P2. 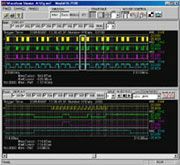 With this function, the user specifies a zone or waveform parameter for a measured waveform. The measurement signal is evaluated and a specified action is performed automatically based on the determination. Available actions include outputting a screenshot to a specified destination, saving waveform data to a specified storage medium, sounding a buzzer, and sending email. 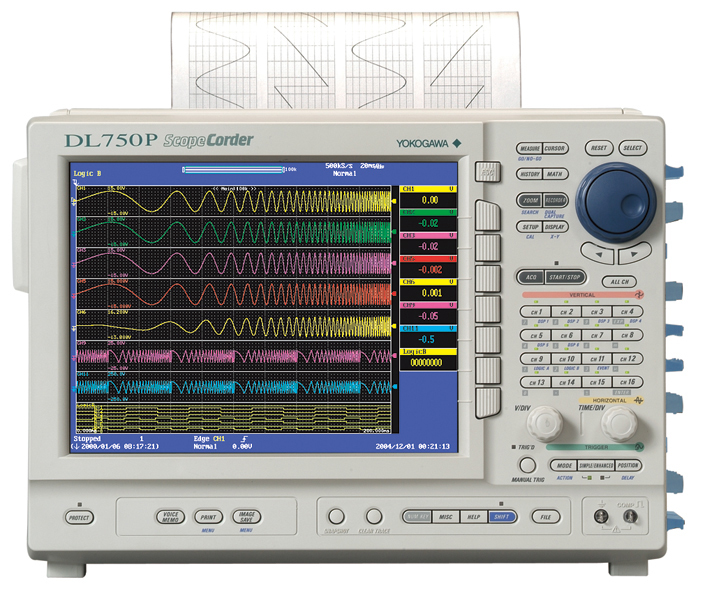 The DL750 comes standard with basic arithmetic operations (addition, subtraction, multiplication, division), FFT (power spectrum), and phase shifting (calculating a phase shift between channels). For more flexible and complex calculations, an optional user-defined math function package is available. With this option, you can define as many as 8 different formulas using a wide range of functions, including a triangle function, differentiation, integration, square root, digital filter, and seven different FFT functions. You can also specify the results of a calculation as a parameter in another formula. With these capabilities, the DL750 makes it easy to perform complex calculations that, in the past, could only have been done by loading data onto a PC. With the optional internal hard drive, you can record measurements to the hard drive in real time. This makes it easier to manage and analyze data using PCs and other tools. Using the snapshot function, you can freeze the currently displayed waveform with the touch of a button. Snapshots are useful for comparing a reference waveform with an input waveform. In addition, snapshots can be saved to and loaded from storage media. This function lets you display multiple X-Y plots together, making relative phase comparisons easy. 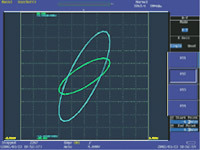 The X-Y display function is a powerful tool for applications such as evaluating DC motors based on a Lissajous waveform. This menu lets you review and modify all of the channel setups from a single screen display. Parameters such as voltage axis sensitivity, screen scale settings, and linear scaling can be configured for each channel. With the SVGA color TFT liquid crystal display, the number of display pixels has been greatly increased. For wide waveform display, set the resolution to 750 × 512 pixels. Just as for RS232 and GB-IB, you can write your own custom programs in Visual C++ 6.0 or Visual Basic 6.0 to control the DL750 through a USB interface. 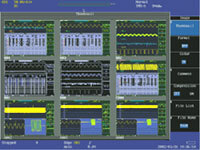 PC communications are made easy with the Waveform Viewer and Wirepuller software programs. 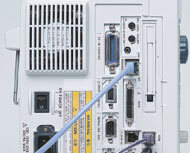 USB keyboards and USB printers can be directly connected to the DL750. The DL750 has a variety of server functions that let you perform remote control or download waveform data and screen images onto a PC. You can also access the DL750 through standard PC software like Internet Explorer and Windows Explorer. Simply press the IMAGE SAVE key to save image data to a CompactFlash card or other storage media. 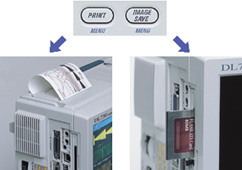 Saved screen image data (PNG, JPEG, BMP or PostScript format) can be displayed on the DL750's screen (as thumbnails). This lets you check needed data immediately when preparing a report. The PRINT key lets you output images to the internal printer, a USB printer, or a network printer. Record and save an explanatory comment (approx. 3-10 seconds) together with your image files. This accessory is required to record voice memos. It can also be used for listening to recorded voice memos. This can be used to connect your DL750 with an external speaker. The A4 size printer records all channels together, with 1600-dot vertical resolution. Using the DL750's GigaZoom function, you can instantly print out only the portions of waveforms that you need, thus saving paper. Waveforms can be printed out continuously in real time while the electronic data is also automatically saved (up to 1000 div or 10 meters).